Hi there sweet friends! Today I made a gift ensemble to share. I can’t think of a better way to give a gift and plus you use up all your scraps. You can probably tell that I’m a matchy-matchy kind of gal. Lol, no shame! The card and tag are here on my blog. 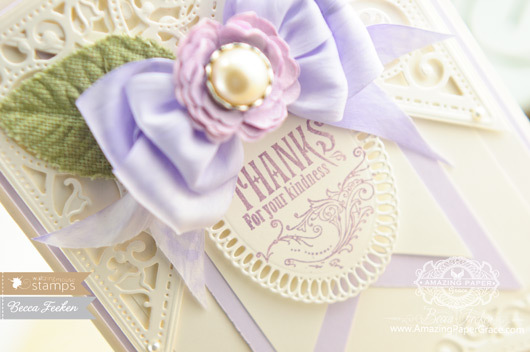 I also created a matching elegant box, and it is over on the Waltingmouse Stamp blog for you to peek at. 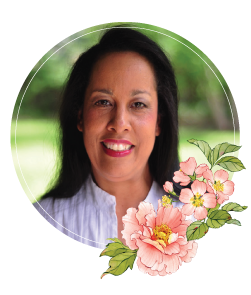 The card is 5-1/2″ x 7″ and uses Spellbinders Gold Elements One which crossover at the top of the card. At the bottom of the card I positioned a panel that is edged with Spellbinders A2 Bracket Borders One. I inserted two pennants – the bottom is 3″ wide and the upper is 2-1/5″ wide and simply cut the tail with my scissors. My sentiment is stamped on the small oval from Spellbinders Elegant Ovals. The size of this oval also makes it perfect for a tag and the holes in the design make a perfect place to tie on a small piece of silk ribbon. Have a wonderful day! Blessings and Hugs to you all! You didn’t say this was an easy card – but even I could do this one. Love how you chose the layers. I am a layer person too. Love the tails and the oval adds so much eleganc with the little holes. Love love love it! Have a great week girl!! Lovely card and lovely matching tag! Super idea. Love the colours too. Will have to take a look at the box! Lovely summer feeling card! The Spellbinders Gold is the same die I used to make my sons wedding invitations, so elegant. Just love your creations, they are an inspiration! 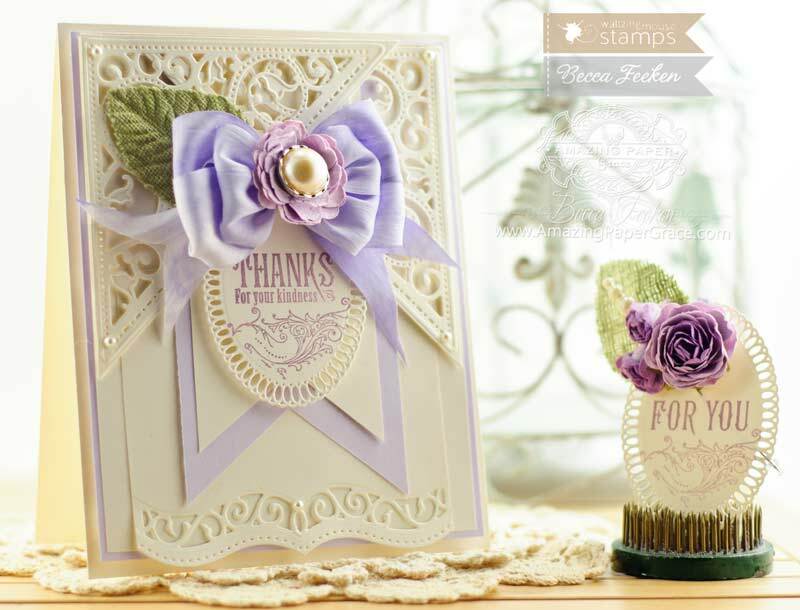 Stunning card, just love it, so pretty. Love the design and the little tag that matches. What a fabulous set, Becca. Thank you so much for sharing your talent so generously with us and for brightening our days with your beautiful creations. What a special gift for someone! As always, they are stunning! Thank you for sharing your wonderful gift! Absolutely stunning! I love the layers, and especially the colors, lavender is my favorite color! Whom ever receives this gorgeous card will feel SO loved!!!! 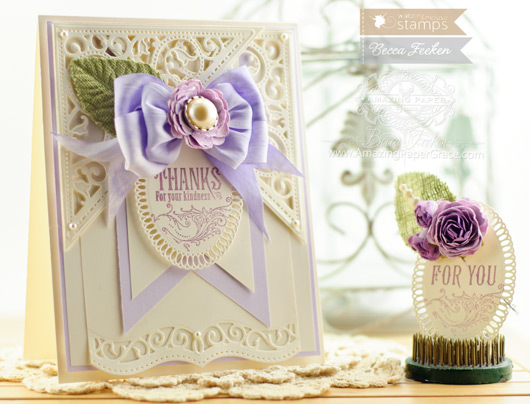 Hello Becca, This card, as always, is beautifully elegant, the colours are soft and gorgeous and the die-cuts are beautifully matted and layered, you are such a fabulous creator of beautiful cards. This card is absolutely fabulous !! So elegant, so exquisite, so beautiful !! What a great tag & card for a gift. You have such great ideas & cards.